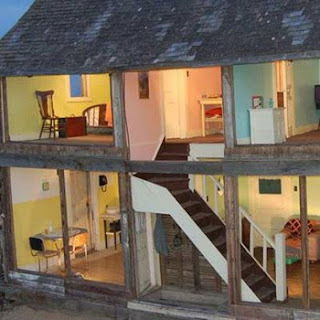 *Life in Miniature*: What if you could live in a dollhouse? As miniaturists we spend our time and skill reducing life to a smaller scale. We're thrilled by the most mundane of objects, somehow made fascinating by their tiny size - "Oh, look, paper towels, how darling!" "That is the cutest dog poo I've ever seen!" "Oooooh, tiny paperclips!" But have you ever thought about doing the reverse? 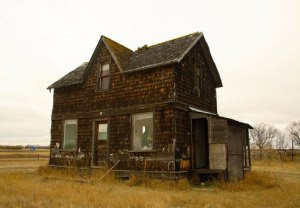 Saskatchewan artist Heather Benning did just that. 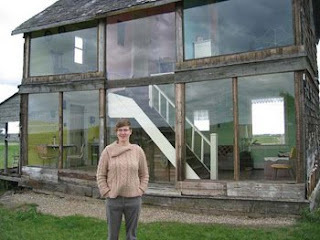 In 2007 she created this delightful art installation in Manitoba, Canada. 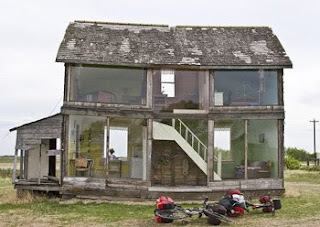 Over the course of 18 months she transformed an old farmhouse into a life-size dollhouse. 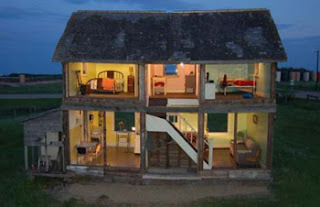 Two stories tall and one room deep, it's a perfect layout for a dollhouse. 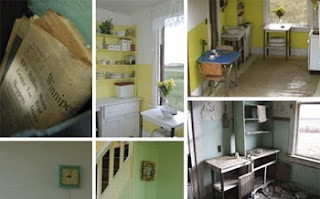 Brightly colored rooms and furniture from the 1960s, when the house was abandoned, add to the surreal feel. And finally, completing the illusion - an entire wall of plexiglas that allows the interior to be viewed! I wonder if she did the Happy Electricity Dance when she got the lights to work? Que maravilla, una casita en miniatura pero al reves jejejejeje. I remember reading about her Even emailed her..lol .. to see if I could write about her...haha. Love her work. She made these giant dolls too? omg that is crazy awesome!